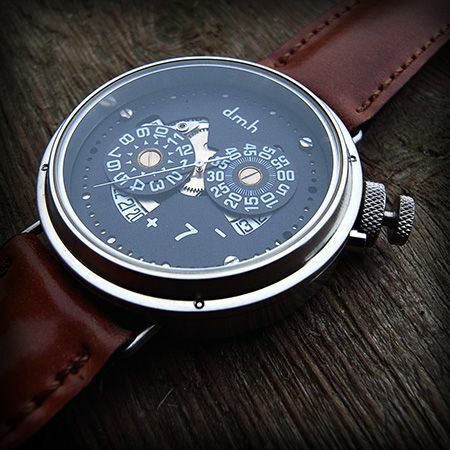 DMH, or Dingemans Mechanische Horloges (Dingemans mechanical watches) is a brand you probably never heard of before (although you might have seen it here and here). It is a very small Dutch watch manufacturer, with a maximum of 12 timepieces per year. Fred Dingemans, owner of DMH, mailed me pictures of his latest creation, a DMH Jumping Hour timepiece. As you can see below, an odd looking fellow with those screws in the dial and this water resistant crown-concept you might see for the first time. I did a small write-up on DMH and their Jumping Hour timepiece for the WatchUseek Blog, the no.1 interactive watch portal lead by Ernie Romers. In the heat of the latest SIHH and GTE news, this might be very refreshing!